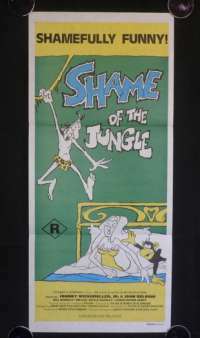 Shame, the ape man of the jungle, is aghast when his woman, June, is kidnapped by a gang of giant penises. They take her to their queen, Bazunga, a bald woman with fourteen breasts. After tangling with a gang of great white hunters, a marauding lion and the Molar Men, Shame sets off to rescue her with only his faithful friend Flicka at his side. He heads for that darkest of areas ..... Bush Country!